CIRCA 1918 - Junior officers of the 1st US Army pose for the camera in France. hd01:59CIRCA 1918 - Officers of the 2nd battalion, 60th Infantry, 5th division pose for the camera. 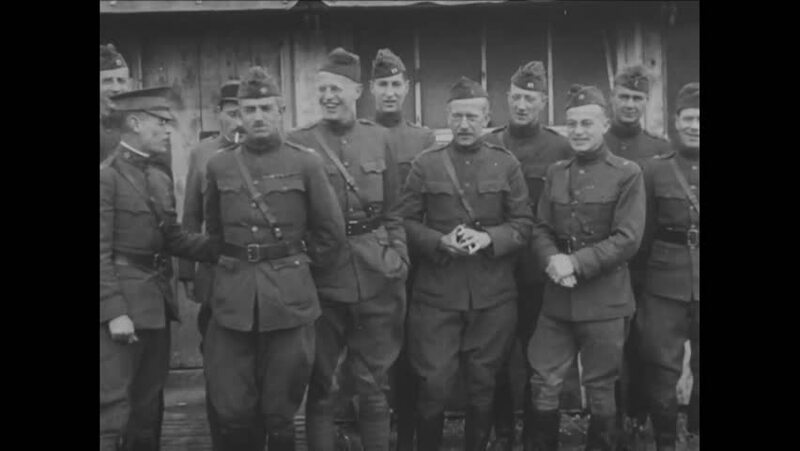 hd01:34CIRCA 1910s - French and American military officers pose at Chaumont, General Pershing and General Petain talk, and decoration ceremonies in France. hd00:38CIRCA 1929-- Major General Charles P Summerall poses with a group of men and sings a song with their hats in hand. hd01:29CIRCA 1923 - Young men participate in a bicycle race, the winner is adorned with a wreath during festivities in Heenreveen, Netherlands. hd01:19CIRCA - 1944 - Important elections have been held even in wartime in American History, similar to this one during WWII, on November 7th. hd00:31CIRCA 1918 - Various soldiers are singled out to be shown at Fort Leavenworth. sd02:011960s: A teen brother and a sister worry aloud over their unwell mom, in a basement, with an amateur radio, in 1960.